Berlin will not recognize the legitimacy of annexation of the Crimean peninsula by Russia and will not accept Moscow’s destabilization of the situation in eastern Ukraine. German Foreign Minister Frank-Walter Steinmeier said this at the German-Russian conference Potsdam Meetings on Monday, an Ukrinform correspondent reports from Germany. "A cornerstone is that we can neither ignore nor accept a flagrant violation of international law through the annexation of Crimea and destabilization in eastern Ukraine," the Minister said. "It has been clear then and now that the annexation could not be recognized ever. It is also clear that there is no military solution to the conflict in Ukraine," he said. 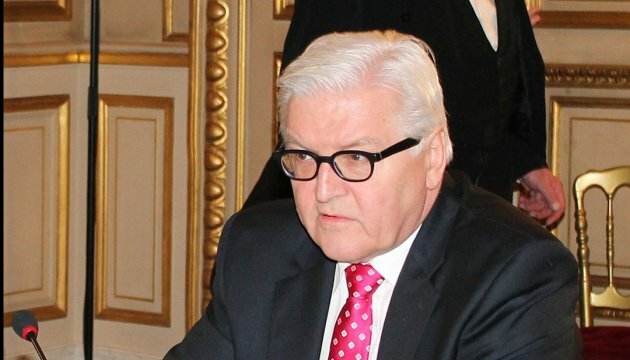 The German Foreign Minister noted he assessed the situation in eastern Ukraine as extremely tense and the progress of implementation of the Minsk agreements as unsatisfactory.